EA Group have just completed the automatic gate replacement and safety upgrade to the Grade 2 heritage entrance, at The Honourable Society of Lincoln’s Inn. 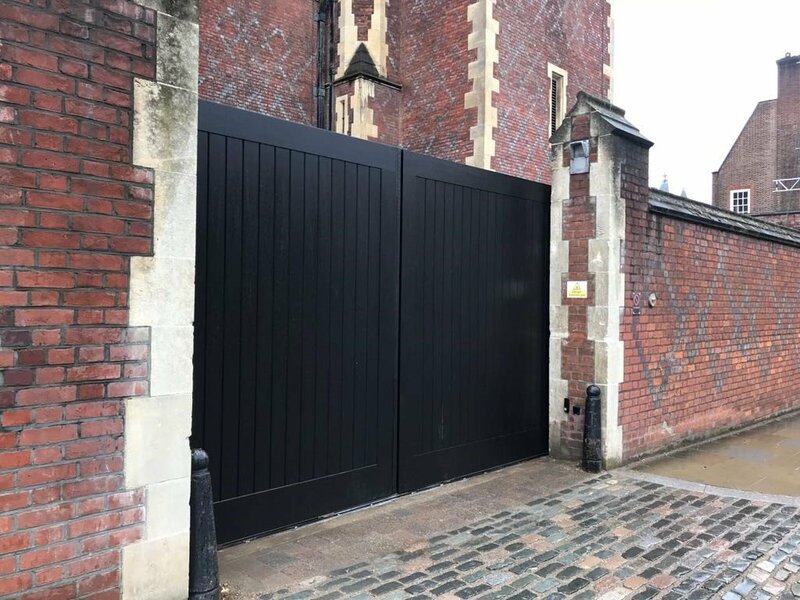 During the course of a major refurbishment, The Honourable Society of Lincoln’s Inn contacted EA Group to provide an automatic gate solution. The challenge was to reproduce an identical set of twin automatic sliding gates replacing the existing entrance. The original gates were reaching their end of life. EA Group used the latest materials that are longer lasting and makes for a more sustainable entrance. Furthermore to add to the challenge, EA Group needed to ensure the gates were BS EN12453 compliant. This involved using the latest safety equipment whilst still not deviating from the original historic based design. The automatic sliding gates were carefully designed to ensure the overall appearance was in full keeping to the original set. Additionally, new master and slave operators were installed for a faster and safer operation. Furthermore, electronic safety in the form of safety edges, induction loops and photocells were neatly installed to the new automatic gate. All of these upgrades ensured that the new gates exceeded current legislation. The Honourable Society of Lincoln’s Inn in London have a safer and more reliable entrance.